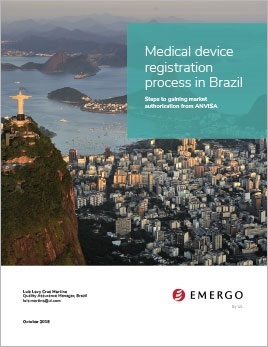 Interested in selling your medical device in Brazil? Brazil's device registration process is well established, but rather complex. It's important to understand the process upfront to avoid delays down the road. You also need to know about approval timelines so you can plan your market entry accordingly. You'll learn all this and more in this 11-page white paper. Luiz Levy is the Director of QA/RA for Emergo's office in Brasília. With more than 10 years of experience in medical device regulatory and quality affairs, his expertise includes ANVISA registration submissions and quality management system implementation and audits to RDC 16/13, ISO 13485, ISO 9001, FDA QSR, and other QMS standards. Luiz holds Lead Auditor certification from BSI and completed a bachelor's degree in pharmacy, as well as post-graduate courses in industrial management and quality management systems in Brazil.